For other uses, see Congo (disambiguation). The Congo Basin is the sedimentary basin of the Congo River. The Congo Basin is located in Central Africa, in a region known as west equatorial Africa. 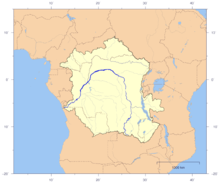 The Congo Basin region is sometimes known simply as the Congo. The basin begins in the highlands of the East African Rift system with input from the Chambeshi River, the Uele and Ubangi Rivers in the upper reaches and the Lualaba River draining wetlands in the middle reaches. Due to the young age and active uplift of the East African Rift at the headlands, the river's yearly sediment load is very large but the drainage basin occupies large areas of low relief throughout much of its area. The basin is a total of 3.7 million square kilometers and is home to some of the largest undisturbed stands of tropical rainforest on the planet, in addition to large wetlands. The basin ends where the river empties its load in the Gulf of Guinea on the Atlantic Ocean. The climate is equatorial tropical, with two rainy seasons including very high rainfalls, and high temperature year round. The basin is home to the endangered western lowland gorilla. The basin was the watershed of the Congo River populated by pygmy peoples, and eventually Bantu peoples migrated there and founded the Kingdom of Kongo. Belgium, France, and Portugal later established colonial control over the entire region by the late 19th century. The General Act of the Berlin Conference of 1885 gave a precise definition to the "conventional basin" of the Congo, which included the entire actual basin plus some other areas. The General Act bound its signatories to neutrality within the conventional basin, but this was not respected during the First World War. Congo is a traditional name for the equatorial Middle Africa that lies between the Gulf of Guinea and the African Great Lakes. It contains some of the largest tropical rainforests in the world. The Congo forest is an important biodiversity hotspot. It is home to okapi, bonobo and the Congo peafowl, but is also an important source of African teak, used for building furniture and flooring. An estimated 40 million people depend on these woodlands, surviving on traditional livelihoods. At a global level, Congo's forests act as the planet's second lung, counterpart to the rapidly dwindling Amazon. They are a huge "carbon sink," trapping carbon that could otherwise become carbon dioxide, the main cause of global warming. The Congo Basin holds roughly 8 percent of the world's forest-based carbon. These forests also affect rainfall across the North Atlantic. In other words, these distant forests are crucial to the future of climate stability, a bulwark against runaway climate change. A moratorium on logging in the Congo forest was agreed with the World Bank and the Democratic Republic of the Congo (RDC, République Démocratique du Congo) in May 2002. The World Bank agreed to provide $90 million of development aid to RDC with the proviso that the government did not issue any new concessions granting logging companies rights to exploit the forest. The deal also prohibited the renewal of existing concessions. Greenpeace is calling on the World Bank to "think outside the box" and use the forest's potential in the battle against climate change. If these woodlands are deforested, the carbon they trap will be released into the atmosphere. It says that 8% of the Earth's forest-based carbon is stored in the RDC's forests. Predictions for future unabated deforestation estimate that by 2050 activities in the DRC will release roughly the same amount of carbon dioxide as the United Kingdom has emitted over the last 60 years. The government has written a new forestry code that requires companies to invest in local development and follow a sustainable, twenty-five-year cycle of rotational logging. When a company is granted a concession from central government to log in Congo, it must sign an agreement with the local chiefs and hereditary land owners, who give permission for it to extract the trees in return for development packages. In theory, the companies must pay government nearly $18m rent a year for these concessions, of which 40% in taxes paid should be returned to provincial governments for investment in social development of the local population in the logged areas. In its current form, the Kyoto Protocol does not reward so-called "avoided deforestation" - initiatives that protect forest from being cut down. But many climate scientists and policymakers hope that negotiations for Kyoto's successor will include such measures. If this were the case, there could be a financial incentive for protecting forests. L’Île Mbiye in Kisangani is part of the Sustainable Forest Management in Africa Symposium project of forest ecosystem conservation conducted by Stellenbosch University. RDC is also looking to expand the area of forest under protection, for which it hopes to secure compensation through emerging markets for forest carbon. The main Congolese environmental organization working to save the forests is an NGO called OCEAN, which serves as the link between international outfits like Greenpeace and local community groups in the concessions. ^ Mineral deposits & Earth evolution. Geological Society. 2005. ISBN 978-1-86239-182-6. ^ "The Fight to Save Congo's Forests". thenation.com. October 22, 2007. Wikimedia Commons has media related to Congo Basin. Pygmies.org: African Pygmies website — first inhabitants of the Congo Basin rainforests.